Mr Market has appeared to shrug off Brexit doldrums (for now) so what effect has that had on our Monkey Stocks League Challenge? Below is a snapshot as at the close of trading on 29th July 2016 and still romping away in the lead for the FIFTH consecutive month was M’s Underdogs Fund! The ‘fund’ is showing a gain of nearly 58% – last month, it was 37%! This is despite the fact that the portfolio includes shares in Standard Chartered, one of the many banks which look unlikely to recover any time soon. For the Live table (during trading hours, Rank and Value will be updated automatically) and full portfolio listings, have a look here and also via the right sidebar. All July dividends have been added to the respective portfolios. However, please let me know if I’ve missed any (or if there are any errors) as there are so many to keep track of. 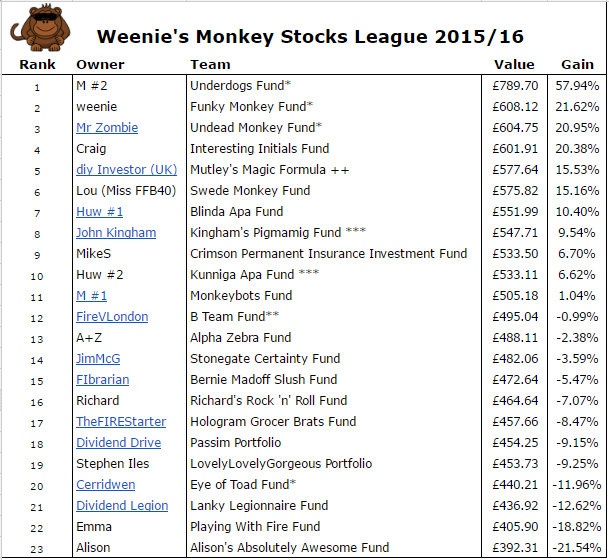 Of the real portfolios, behind the Underdogs Fund is my own Funky Monkeys battle with Mr Z’s Undead Monkeys for second place, both with healthy gains of over 20%. FireVLondon’s B Team Fund continues to languish in mid-table obscurity, with Cerridwen’s Eye of Toad Fund just out of the bottom 3. John Kingham’s Pigmamig Fund drops to 8th place, with Huw’s Kunniga Apa Fund dropping into 10th. Just two more months for either/both to finish above the monkey funds by the end of the competition – it’s not looking good for the ‘experts’! As mentioned before, diy’s Mutley’s Magic Formula fund maintains its steady process and ends yet another month in the Top 5. This fund is based on Vanguard’s 60% LifeStrategy Fund and appears to not bounce around as much as the funds made up of just 5 stocks. 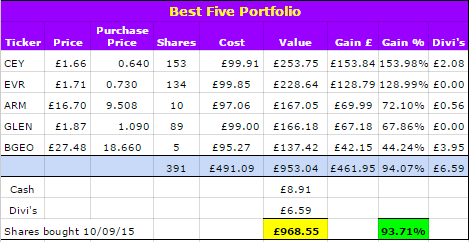 The best 5 performing shares since the start of the league are Centamin plc, Evraz plc, ARM Holdings plc, Glencore plc and BGEO Group (previously Bank of Georgia Holdings plc). The worst 5 performing shares were Nostrum Oil & Gas plc, Barclays plc, Restaurant Group, OneSavings Bank plc and Interserve plc. 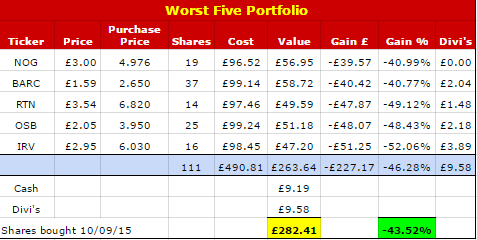 If you’d had the misfortune to pick this lot, you would have seen your portfolio value drop by nearly a half – ouch! Two more updates to go before the winner is announced – has M got the trophy in the bag? This entry was posted in Blindfolded Monkey, Monkey, Shares by weenie. Bookmark the permalink. We expect to begin investing some time by the end of this year, and while it’s a big step, I have to say that this series makes me feel a whole lot better. We don’t have to be experts – we just have to do our research, take things slowly, and learn as we go. We may not win all the time, but from the approaches taken in the Monkey Stocks league, we aren’t likely to lose all the time either, which is always a concern when starting something new. Whilst I wouldn’t recommend the ‘blind-folded monkey’/random method of picking investments, this experiment of mine does go to show how random the stock market can be. Doing your own research and diversifying your investments will minimise risks but no, we don’t all have to be experts. Good luck when you start with your investing! Hey M, yep, this strategy (and other monkey strategies) are for fun only and shouldn’t form a large part of your portfolio. Hope all’s well with you and your family.